The variety of beet discussed here is the deep red beetroot. It is found around the world. The health benefits of this root are tremendous. It is great for the arteries, lowers cholesterol and blood pressure, helps the liver function properly, and has plenty of antioxidants for preventing cancer. When at the market, look for small to medium-sized beets. The roots should be dry (but not cracked), smooth, and deep in color. As a general rule of thumb, the smaller the beer the more tender. If sold with leaves, look for leaves which are green, not frayed, and fresh. 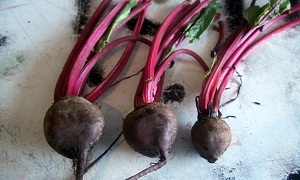 Although the greens do not directly tell the quality of the beet, they are a good indicator of freshness. Also, you can cook the greens as well, for a very nutritious side dish. Fresh beets will last about 2 weeks in the refrigerator. To store, remove the greens, leaving 2 inches (5 cm) of stem remaining. This will prevent the greens from stealing moisture from the beets, and leaving 2-3 (5-8 cm) inches of stem will stop the beets from bleeding. Wrap the beets up in a plastic bag and tie the bag off to make it air tight. Beet greens will last about 2 days in the refrigerator. The greens should be stored in an open plastic bag in the refrigerator. Beets should me carefully washed under cold water. Try not to break the skin of the beets while washing, this cause the beets to bleed out many of their nutrients while cooking. If eating raw, wash first, then peel with a vegetable peeler or a knife. Then grate with a cheese grater. Raw beets are a great garnish for salads. Yes! Beets can be microwaved! And its easy, place the beets in a covered container in the microwave. Choose a container that is just big enough to hold the beets. It’s best to rotate the beets halfway through the cooking time. After they are finished, let the beets cool for a couple of minutes, and then the skins will easily rub off with a paper towel or a knife. Three small beets (the size of the one in the picture below) will take about 8 minutes on maximum power. 5 small beets totalling 1 pound will take 10 minutes to cook. 1 large, 1 pound beet will take 20 minutes to cook. Boiling is another option for cooking beets in a hostel. It isn’t as fast as the microwave, but not all hostels have microwaves. 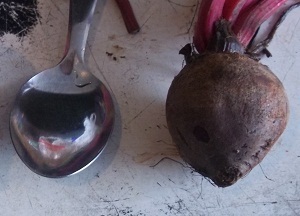 Three small beets (the size of the one in the picture above) will take about 15-20 minutes. 5 small beets totalling 1 pound will take 20-30 minutes to cook. 1 large, 1 pound beet will take 30-40 minutes to cook. If beets are peeled and sliced into uniform-sized, thin, 1/4 in ( 7 mm) slices, they can be sautéed without boiling or cooking beforehand. Sautée with a spoonful butter for about 1 minute, then add a spoonful of water and cover. Cook for an additional 3-4 minutes. The beets will be tender and ready to add as a side dish!